“This is the story of something that happened in the time of Xerxes, the Xerxes who ruled from India to Ethiopia—127 provinces in all. King Xerxes ruled from his royal throne in the palace complex of Susa. In the third year of his reign he gave a banquet for all his officials and ministers. The military brass of Persia and Media were also there, along with the princes and governors of the provinces” Esther 1:1-3. Thus begins the book of Esther, a mere 10 chapters that can be read in under an hour, one of the 66 books that make up the Bible. I was tempted to say it is an intriguing and unusual part of holy scripture with lots of twists and turns but I resisted, for so much of the Bible is just like that. I got thinking about Esther, not just because of today’s text “you have been raised for such a time as this”, which for any follower of YHWH should give great encouragement, but because of the surprising outcome, which has in my view a pertinent bang up to date application as well as a more obvious one, which I will get to in due course. I smiled remembering many years ago visiting an elderly lady in a Jewish old folk’s home, who introduced herself as Esther, who had a lovely way about her. I reminded her that Esther was a queen, who happened to be beautiful, and told her so was she! Recounting the contents of the Book of Esther in a nutshell, the four main characters are Xerxes (the mighty king), Esther (the beautiful girl that was to become his queen), Haaman (the king’s chief advisor and strategist) and Mordecai (Esther’s uncle and guardian), plus one other, not mentioned presumably because of censorship: God. Very simply put: the King was looking for a replacement wife (his first wife had upset his chauvinist sensibilities and her disrespect had incurred his displeasure); Esther was put in the frame and won the kings favour; Mordecai learnt of a plot to overthrow the king and this was related back via Esther and the plotters were exposed; Mordecai was disliked by Haaman because he showed no deference; Haaman tried to get his own back by tricking the king to sign a proclamation to kill all the Jews in his empire; Mordecai relayed the news to Esther, who fasted and worked out her own plan to expose Haaman; through implementing the plan, Haaman was exposed and hanged; Xerxes signed another proclamation (he couldn’t rescind the first) to allow Jews to defend themselves and be defended when attacked. Mordecai was elevated into Haaman’s position and presumably Esther and Xerxes lived happily ever after, and every year, from then onwards until the present day, Jewish folk celebrate the Feast of Purim in order to commemorate their deliverance. If I were to preach a sermon on the story of Esther, I would use the words of Mordecai to Esther, that she had been put in the position she was in (Queen) “for such a time as this” as my text refers. However, ordinary we may be, whatever our circumstances and life’s experience, however difficult or surprising our journey has been so far, etc. 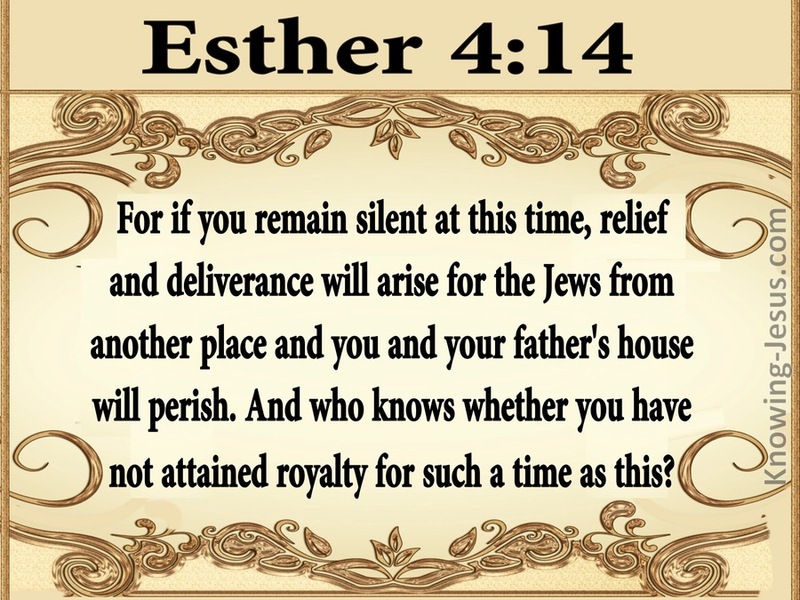 we like Esther are in the position we are in for such a time as this. Looking around us, in whichever direction that might be, there are situations we could potentially effect to bring out the purposes of the Almighty. It may not be a biggie, like saving a whole race (in this case the Jews) from total annihilation, but even so it could still be significant. So the message is for us to be to be prepared, take heart, and make use of the opportunities that present themselves for God. A sermon I would probably NOT preach, as tempted as I might be, as it would likely cause too much misunderstanding and distraction, is just maybe US President Donald J Trump has been raised up for such a time of this. Right now he is being got at from many quarters: the Mueller special investigation, his inner circle of generals keeping him away from dissenting voices; opposition from all quarters committed to bringing down the President, if need be by violence. Like King Xerxes, he cannot do the modern equivalent to reversing the Law of the Medes and Persians. I might suggest the president ponder: “the king’s order authorized the Jews in every city to arm and defend themselves to the death, killing anyone who threatened them or their women and children, and confiscating for themselves anything owned by their enemies. The day set for this in all King Xerxes’ provinces was the thirteenth day of the twelfth month, the month of Adar. The order was posted in public places in each province so everyone could read it, authorizing the Jews to be prepared on that day to avenge themselves on their enemies” Esther 8:11-13. Whatever the President does to counter plans to do away with him, it will be nothing like what Xerxes did, but he could / should take a leaf from Xerxes’ book, for as Esther said as she embarked on her audacious plan to save her people: “if I perish, I perish” Esther 4:16, for the truth is: the stakes are that high.